Fordham University Press, 9780823240227, 228pp. children, but Ed's parents never came back for him. And they never signed the legal papers so that he could be adopted by another family. gives a brief history of each institution before describing that world--the Sisters and Brothers who raised him, the food, his companions, and the Catholic community that provided social and emotional support. to reflect on his own story and to talk to the people who raised him, Ed begins to see a larger story intertwined with his own. 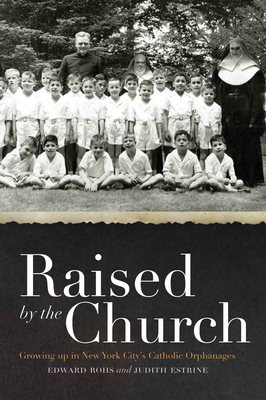 With original research based on interviews with clergymen and nuns, archival data from the New York Archdiocese, and government records, Raised by the Church tells the social history of an era when hundreds of thousands of Baby Boomers passed through the orphanage system. Through the story of one man, this book gives us a much needed historical perspective on an American society that understood and acknowledged the community's need for a safe haven. Edward Rohs coordinates mental health service for the New York City Field Office of the New York State Office of Mental Health. He is a former psychotherapist and social worker for abused and abandoned children and their families. Ed's skill at interacting with people of all ages across cultures, combined with his irreverent sense of humor, has made him a much-loved role model and mentor to generations of children and their families. Judith Estrine is a writer. She lives in New York City.